In the faraway land of Ethnos, a new Age is dawning. The ashes of the old Age have left the Six Kingdoms empty and the twelve Tribes scattered to the winds. Now is the time for a clever leader to unite them into a powerful alliance, skilfully using the unique talents of each Tribe to control the Kingdoms. Do you have the wit and the wisdom to become the next Lord of Ethnos and usher in a Golden Age? 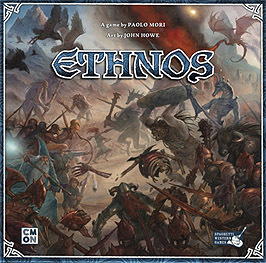 In Ethnos, players compete to become the next Lord of Ethnos. Whoever controls more Kingdoms and recruits more Allies than their rivals will claim the most victory points and the title of Leader! To become the Lord of Ethnos, collect scattered members of the 12 Tribes, forming Bands of Allies to control Kingdoms. Choose the Leader of each Band wisely, as only the Leader can use special abilities to aid in your quest to rule. If you gather the most Glory over three Ages, you'll be crowned the Lord of Ethnos and win the game!